Govindas is a pure vegetarian restaurant, committed to serving quality homemade fresh dishes daily, using only the finest ingredients, at affordable prices. Govindas is dedicated to providing a healthy and tasty variety of European and Indian Vegetarian Food at affordable prices. Vegetables are tastefully prepared in every imaginable way, served with rice, basmati or salads. The original of four Govindas in the city, this Aungier Street restaurant is an established and popular place to eat at lunchtime or in the evening. With a unique atmosphere and dedicated, friendly staff, Govindas caters for vegans, coeliacs, children and all those seeking healthy, freshly-cooked dishes which are meat-free. Main courses feature Govinda Specials, Veggie burgers with tasty dressings, home style soups and Panir - delicious homemade cheese curd chunks served in tomato sauce - is a speciality. 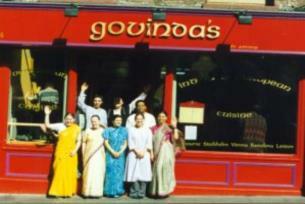 Govindas is a charity registered under ISKCON Ireland. ISKON is an acronym for International Society for Krishna Consciousness.